Volterra’s intimate dining room is the perfect choice for your next celebration. Our banquette seating allows us to easily put together group dining for up to 30 guests. Or depending on availability, the entire dining room is available for a full buy-out. Groups of 10 guests or less may order from our full dining room menu. 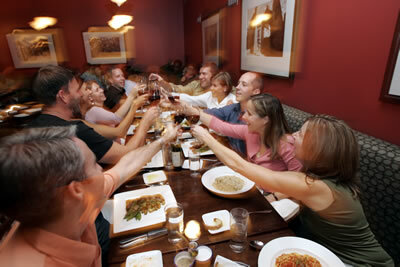 For groups of 11 or more, we will work with you to create a limited choice menu. Our limited choice menu allows your guests the opportunity to select their own entrée on the evening of the event. Appetizers, salad and dessert courses are pre-selected by the host of the event. Group dining in the main dining room is welcomed on Sunday through Thursday evenings. On Friday and Saturday nights, we can only accommodate groups up to 8 guests. A credit card is required to book reservations over 8 guests. A $10 per guest cancellation fee will be applied for cancellations within 24 hours. Or let us come to you and cater your next event in your home or other venue.